Colorful poly pockets organize your binder with style and efficiency. Keep information accessible by labeling all of your document storage items. Group letter-size sheets into the Binder Pockets and use the write-on index tab to make it easy to identify where information is. Colorful poly pockets organize your binder with style and efficiency. Full size pocket with flap holds additional materials. Write-on index tabs allow you to instantly categorize your binder. Works with pencil, ball point pen or permanent marker. 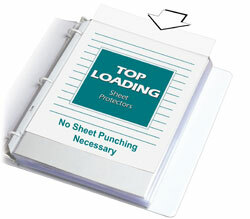 For use with standard 3-ring binders. Acid-free poly protection. For 8 1/2 x 11 document storage. Side loading. Assorted colors includes amber orange, lime green, charcoal gray, raspberry red, steel blue.